Castle fans will have to wait one more week for the series to return to ABC with the second half of season eight. The series was originally scheduled to return with new episodes on February 1, but now the series will air its first new episode on February 8. Castle has been at the center of a lot buzz in recent weeks because of comments made at the Winter TCA’s. TV Series Finale previously reported that the series may end at the completion of this season. TV Line reported that the delay is due to ABC giving Bachelor Live an extra live episode on February 1. In addition to the one-week delay, ABC has given Castle a special extra episode airing on Valentine’s Day, February 14. The episode will follow a special episode of The Bachelor that will take the series into the courtroom. It is being teased that this is a “first” for the series. Castle will also air their regularly scheduled episode on February 15. That means Castle fans will see three episodes air in the span of eight days. Is that a Castle overload? Will you watch all three episodes? Tell us what you think. More about: Bachelor Live, Bachelor Live: canceled or renewed?, Castle, Castle: canceled or renewed? 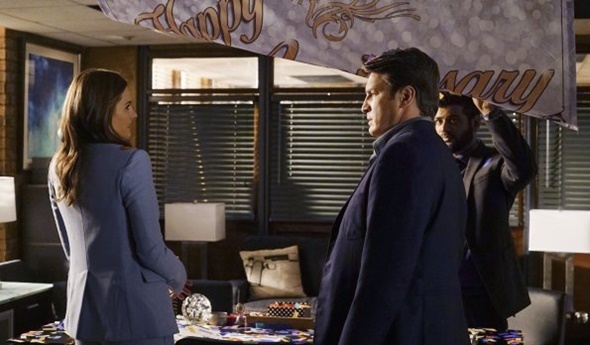 Castle: Renewed for Seasons Six and Seven? Just happy to see it back, been having Castle withdrawal! I love this show and there could never be too much Castle! Love this show……never too much of Castle! There can never be too much Castle! Haven’t ever enjoyed a tv show this much. If they could keep the quality of writing I could watch it daily as a soap-opera. It’d be a tough slog without Fillion & Katic. I have always loved to watch Castle. It is so much better than a lot of junk nowadays on TV. I don’t even know why I pay for cable.